Lots of pictures = Allow time to load if using dialup! 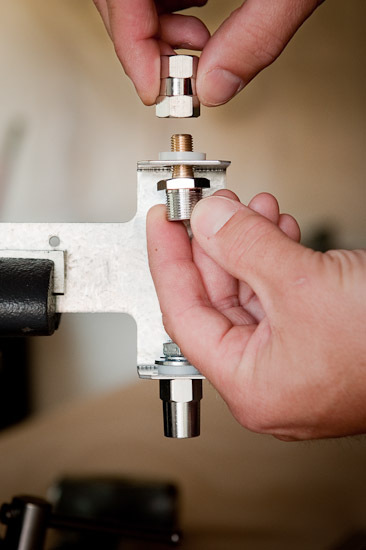 "Simple and Inexpensive Dipole and V Antenna Mount". First, I must say that setting up a base radio (11 meter) and accompanying antenna is a new hobby for me. I'm a complete newbie. When I first started working on my 11M CB base station, I knew I had to figure out a way to get an antenna up without breaking any of my neighborhood rules. I live in a subdivision governed by a Homeowners Association, so we have certain rules that prevent homeowners from erecting/mounting antennas on their houses. An 18ft Solarcon A99 was out of the question. 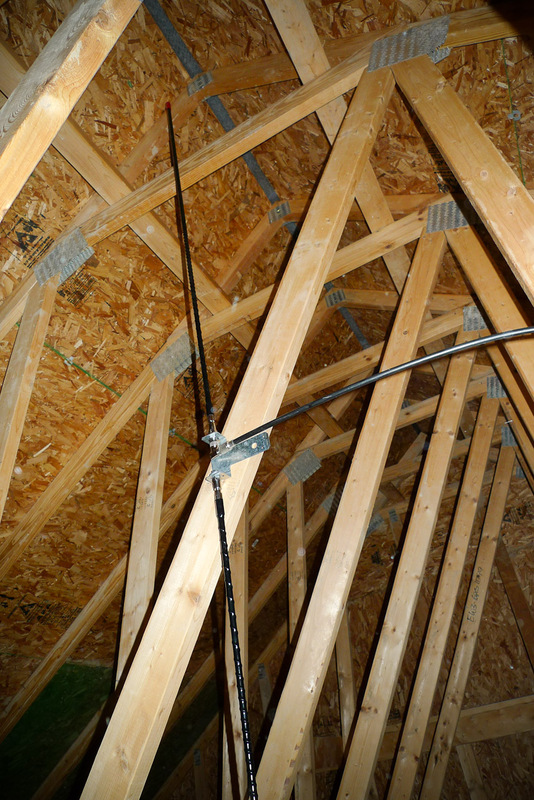 After doing some research, I learned that a dipole antenna mounted in my attic might do the trick. About this same time, I came across John's article on Hamuniverse.com describing a dipole antenna he made using mobile fiberglass type CB antennas. Making a dipole antenna from off-the-shelf items that could easily be purchased from the local truck-stop (Travel America) and hardware store (Lowes) sounded great to me. Plus, with it mounted in my attic, it would be the perfect "stealth" antenna to keep the homeowners assocation happy. Could it work for 11M CB? I didn't know. Afterall, his article was on a "HAM RADIO" website. After reading John's article, I had some questions so I emailed Don, N4UJW at Hamuniverse.com. Don responded to me promptly and put me in touch with John directly. John was glad to answer any questions I had. Before we get into the actual antenna assembly, let's look at a few pictures illustrating my installation. The antenna is in my attic, and my 11 meter CB base radio is in my kitchen. To connect the two, I purchased 100ft of "Davis RF 9914F Bury-Flex 50 ohm Heavy Duty Coax". I found it on eBay for about $90 (US Funds). It's GREAT stuff! 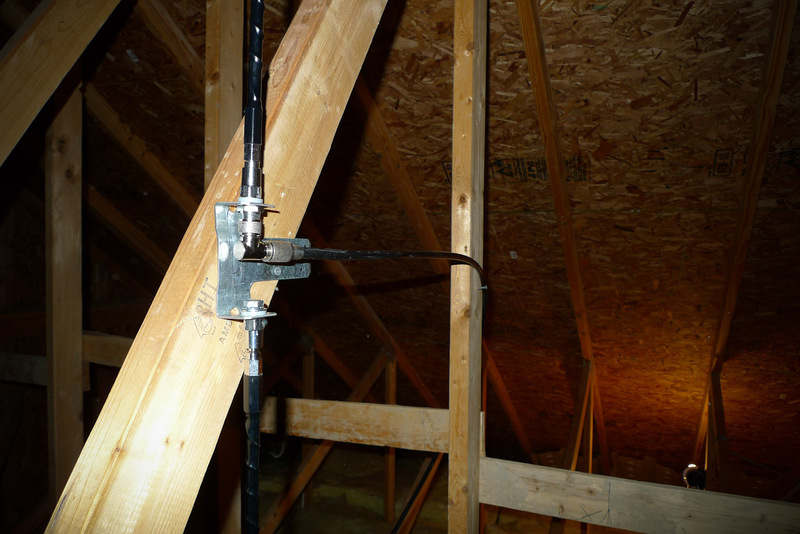 Picture showing which attic in the house I mounted the antenna. The back of the house faces South. As you can see, there are lots of other houses around. 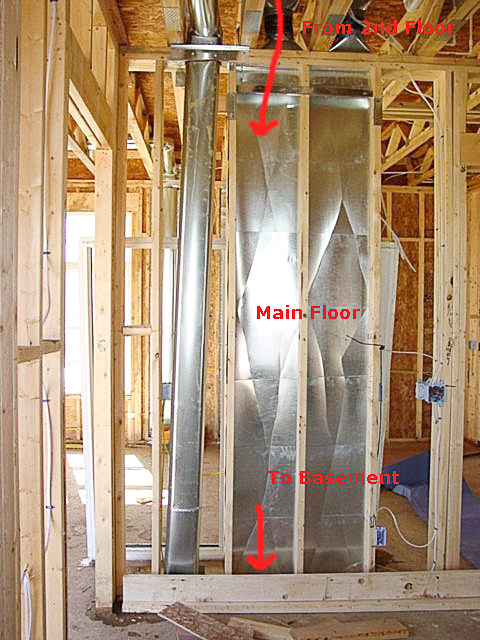 I fished the coax to the basement through a cold air return duct (not within code, I know) with the help of a friend. 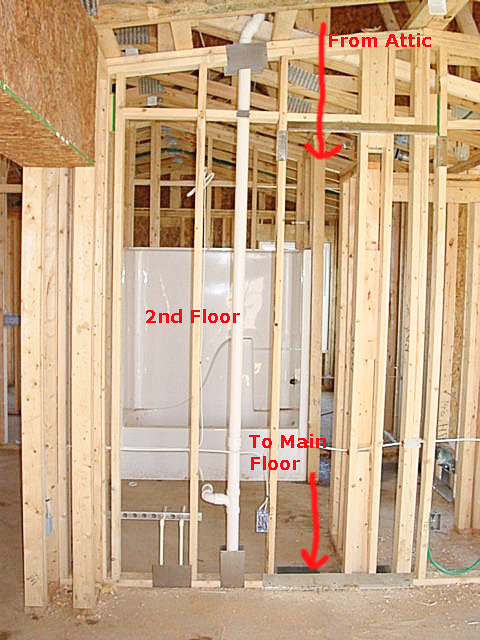 I took this picture when the house was being built because I thought it would come in handy someday for projects like this. That was a good decision. Ran the coax across the basement ceiling, and up into the kitchen. I like that brush wall-plate. The coax terminates at my Uniden Washington base station. Nice radio. Basically, you unwrap the coil and then snip (NOTE: The following was done to both the top and bottom antennas). I'm happy with those readings. During the tuning process, you may have noticed that channel 01 got down to a 1:1 SWR. On my last snip, it creeped back up to 1.05:1. I figured it was time to stop tuning, especially since the other two channels were both within spec now. It's nice to know that this antenna was very tunable and a tuner is not required to use it. I think the hardest part of this project was tuning the antenna without a helper. It took some extra time to climb into the attic, snip some of the antenna, climb out of the attic, check SWR reading, climb back into the attic... I probably did that 5-6 times. I think my patience paid off though. I'm in Ann Arbor, MI, USA. Over the last couple of days, I've heard 11 meter DX from Illinois, the Carolinas, Georgia, Texas, New York, New Jersey, Minnesota, Michigan, Ontario Canada, Ohio, Tennessee, Alabama, West Virginia, and Florida. Unbelievable to me, and very exciting! All from a home grown antenna built from mobile antennas and mounted inside my attic. How cool is that? When the DX isn't active, I'm able to talk locally up to 3-4 miles. Hints - If you get the "T" from Lowes website, search for Simpson 66t. Step 1: Mark the locations for the new antenna mount holes, and the lines where you'll bend the Strong-Tie "T". See the image for measurement locations. 1. 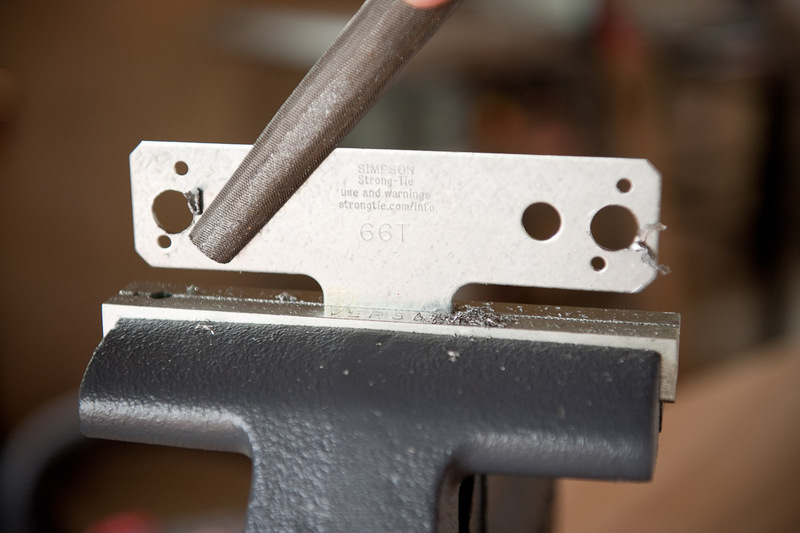 1/2 inch from edge to center point between 2 small existing holes on each side of the "T". This is where you will mark and use a center punch to drill the hole for the antenna mount in the next part of the project. See picture below. 2. 1 5/16 inches to bend point on T from each side. Step 2: Before drilling the antenna mount holes, take a center punch and punch a mark in the Strong-Tie "T" at the hole locations. This gives the drill bit something to bite into when starting the hole. 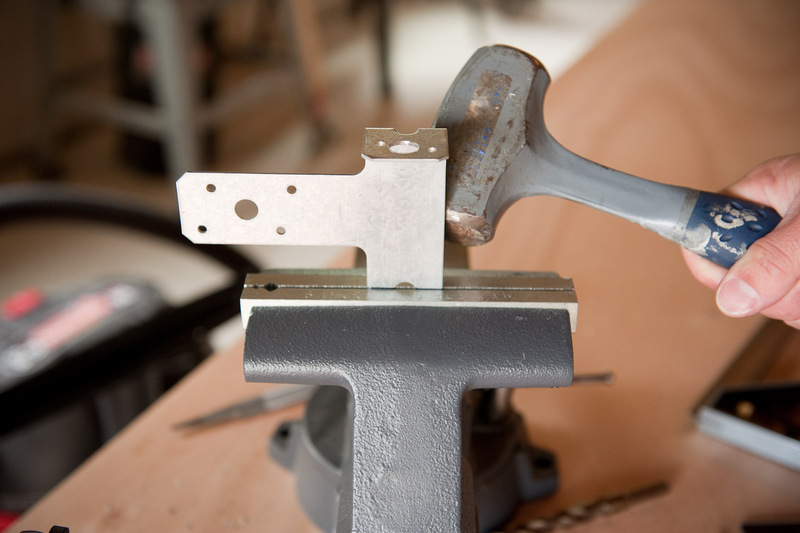 Step 3: Drill the holes where the antenna mounts will attach to the Strong-Tie "T". 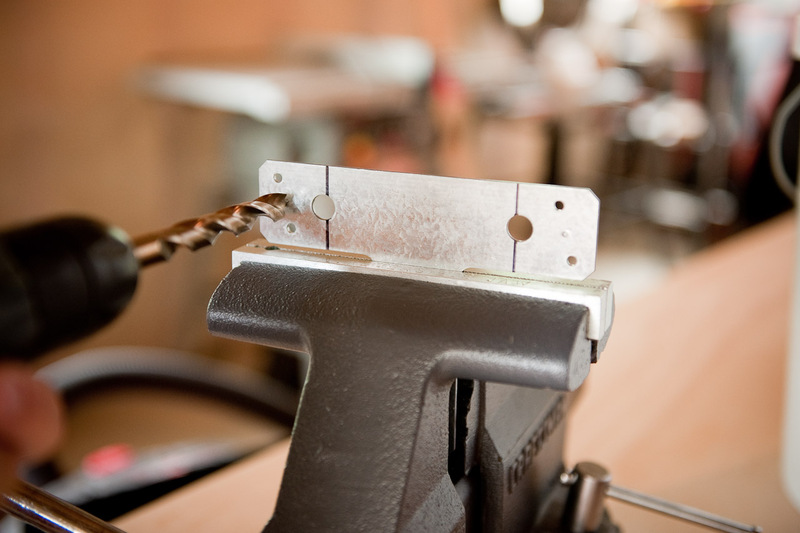 Make sure you use a 1/2" drill bit. 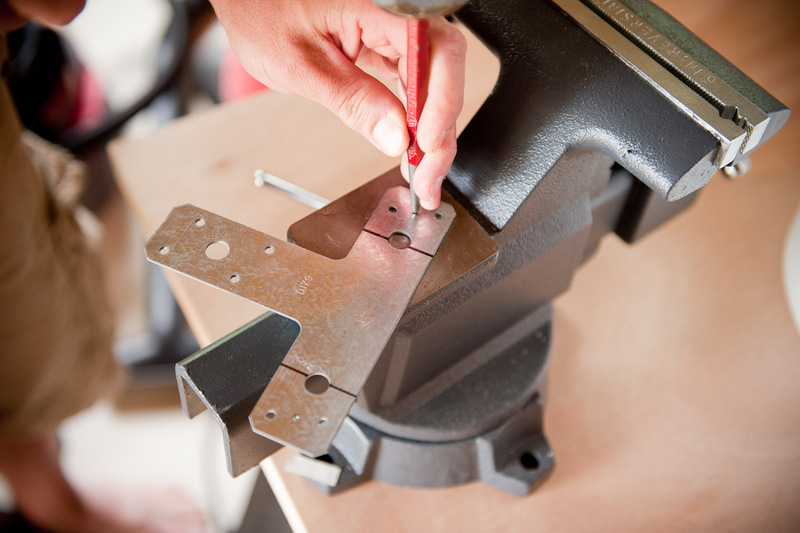 Step 4: You'll probably end up with some sharp metal burs after drilling your antenna mount holes. Just take a metal file and file them down. 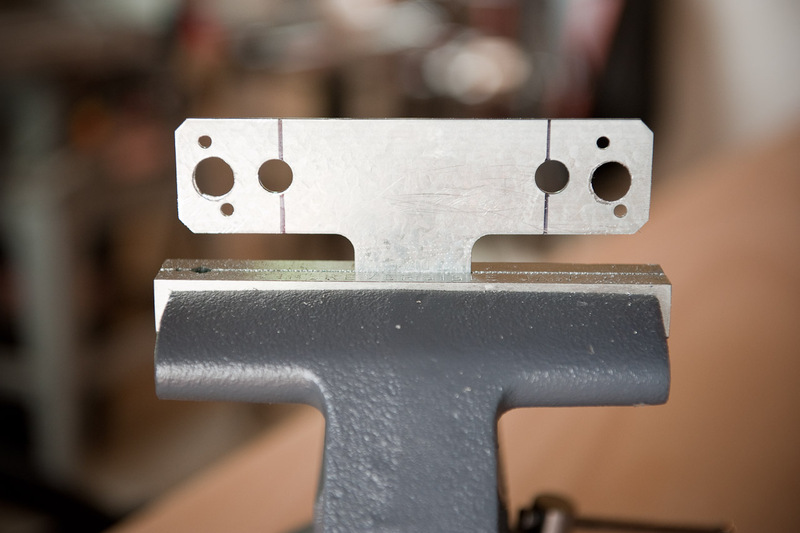 Step 5: This is what your Strong-Tie "T" will look like once you're done drilling the holes. Lookin' good! Next you'll be making the appropriate bends. 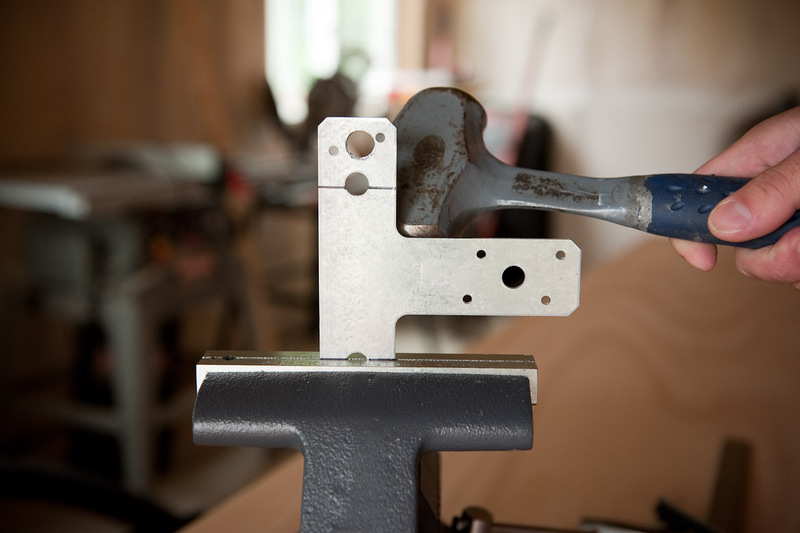 Step 6: Mount your Strong-Tie "T" in your vise so the top edge of the vise lines up with one of the lines you drew in Step 1. Once you're confident you have it locked tight in the vise, and square, then take your hammer (I used a 3-4lb hand sledge) and start hammering the bend into place. I started gently hammering near the black line to get it started. 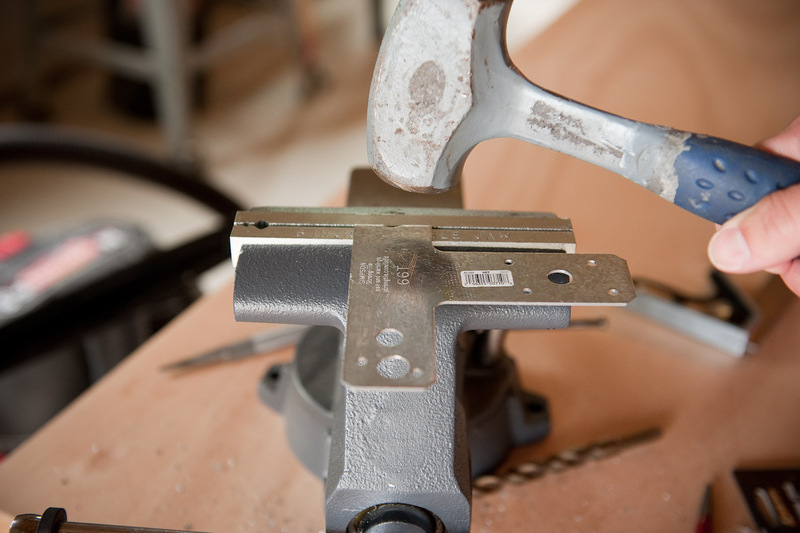 You may want to use your free hand to pull the top in the direction you're hammering too. Once you get it started you'll be able to hit it a bit harder. 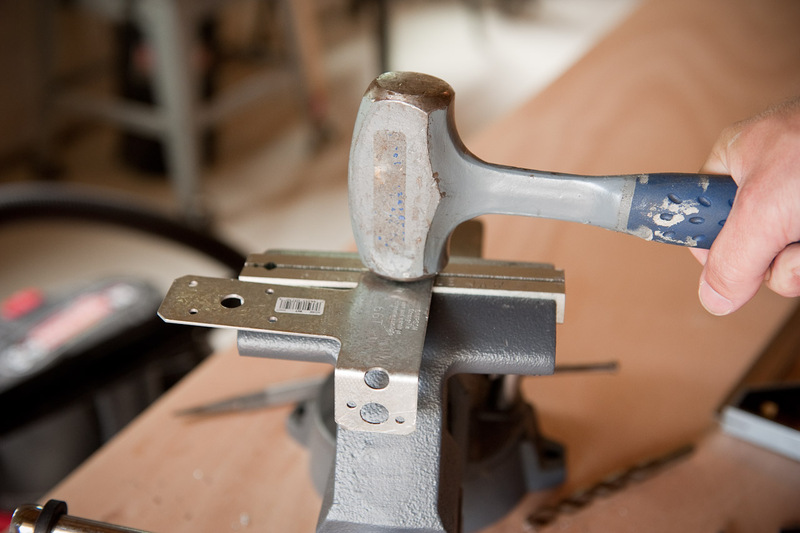 Step 7: Keep hammering until you have a 90� bend. Step 8: Flip the Strong-Tie "T" around and line up the other line just like you did in Step 6. Hammer away! 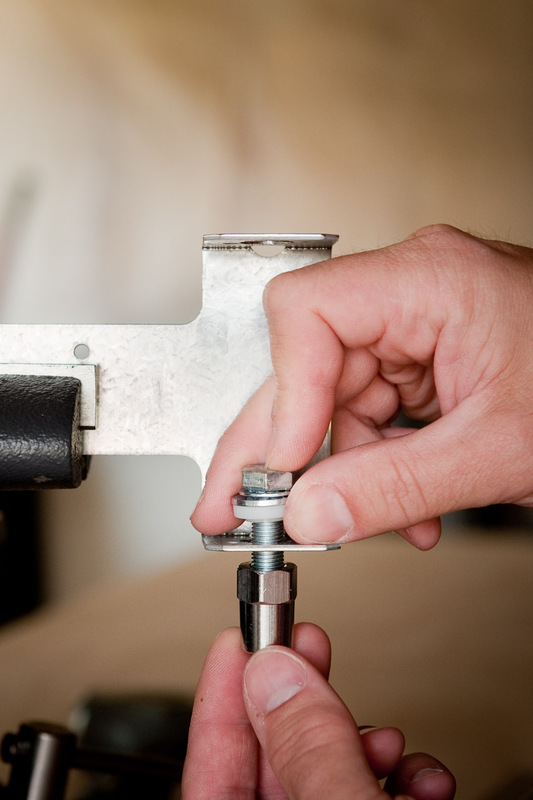 Step 9: Keep hammering until you have a 90� bend. Step 10: The completed Strong-Tie "T" antenna bracket. Lookin' good! Step 11: Mount the antenna stud mount (Diesel Part#: 360-53401) to the lower portion of the bracket. The mount may come with two plastic insulator/spacers. You'll want to use only one of the plastic spacers (or none). 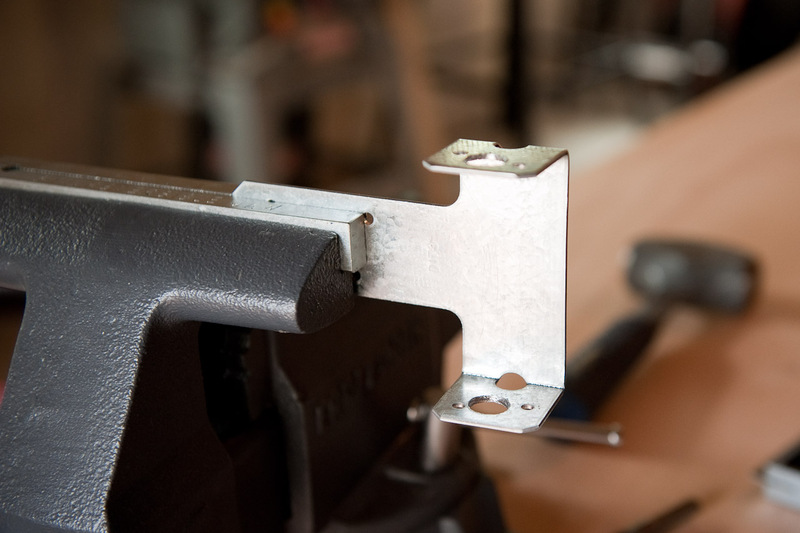 Some part of this stud mount *must* come in contact with the metal Strong-Tie "T" bracket. This antenna will be the "cold" antenna (see Step 12 for an explanation). 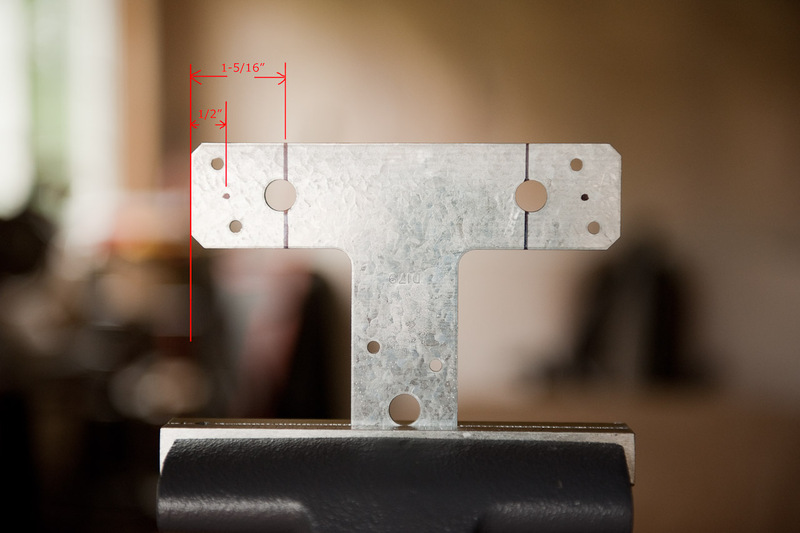 Step 12: Mount the "plug to plug" antenna mount (Diesel Part#: 360-53402 or 360-53403) to the top part of the bracket. It's important that this mount be attached to the top antenna in a vertical dipole scenario. 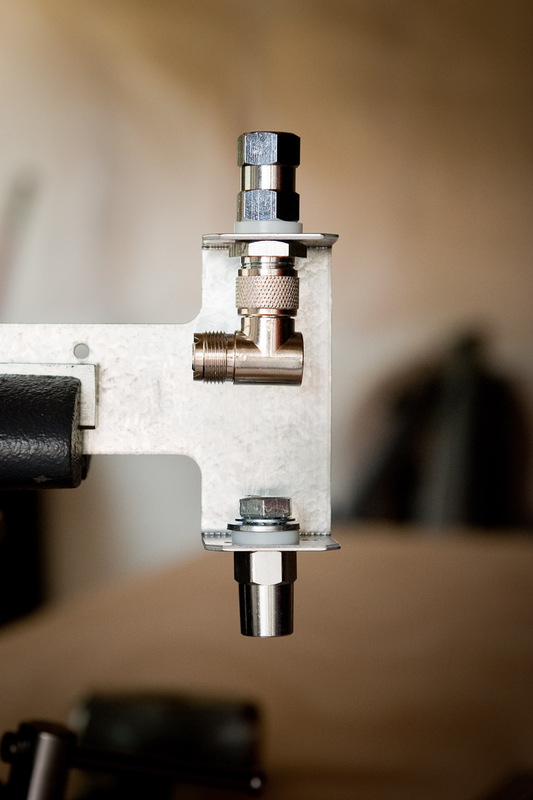 You'll want your coax to attach to the top antenna. It's also very important that the plastic insulator/spacer goes between the bracket and the actual mount that the antenna will thread into. This will isolate the antenna from the bracket. John (KL7JR) said, "One of the antennas on the dipole (hot) is isolated from the mount and the other is not (cold). They are paired up with your center conductor on the coax (hot) and with the shield (ground-cold). For horizontal polarization, either antenna can be hot but for vertical polarization you want the top hot." 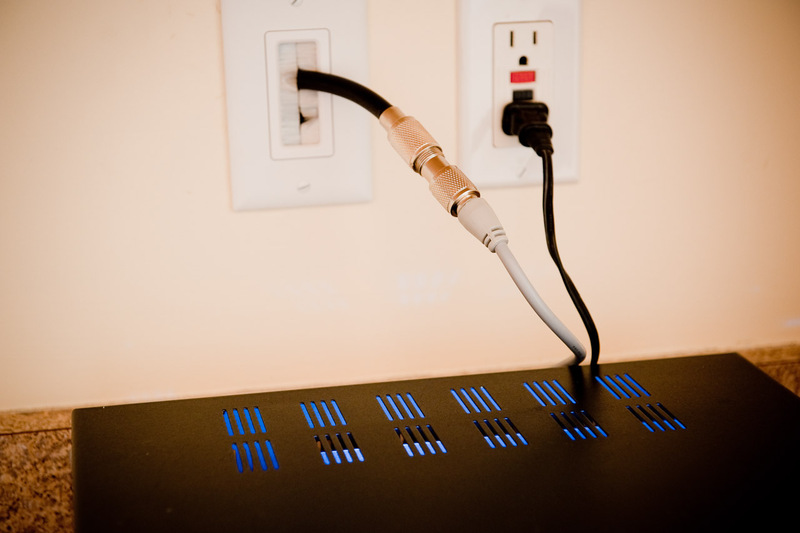 Step 13: Mount the PL-259 L-Connector to the "plug to plug" antenna mount (Step 12). That's it for the bracket. You'll now need to find a place to mount it (if you haven't already) and connect your mobile antennas. Hopefully you'll have a helper when dialing in your SWR. 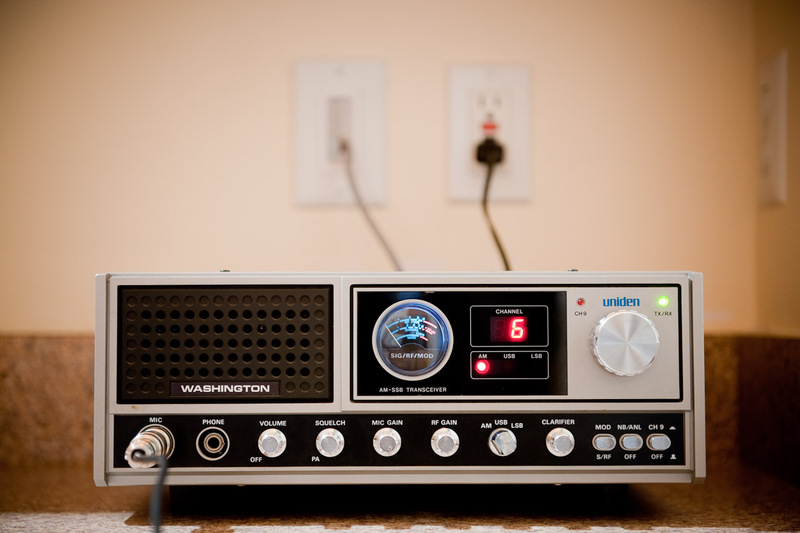 "Although this could be taken as a CB radio related article which normally do not appear on Hamuniverse.com, Scott did such a fantastic job in showing us how to use the "T" mount taken from the article by KL7JR, that we wanted to share it will ALL radio buffs....thanks Scott for a really nice job with the article, photos, and helping us get this project on Hamuniverse.com.....73 Don, N4UJW"
and click on your chosen image. Monitor police, fire, ham radio, rescue, ships and more!